Pune-based Government-funded Startup Incubator, Venture Center, (winner of a national award for best technology incubator in 2015) is hosting a seed fund with a corpus of Rs 10 crore under the scheme “National Initiative for Developing and Harnessing Innovations – Seed Support System (NIDHI-SSS)” of the Department of Science and Technology. The basic idea of NIDHI seed support is providing financial assistance to potential startups with promising ideas, innovations and technologies. This would enable some of these incubatee startups with innovative ideas/technologies to graduate to a level where they will be able to raise investments from angel/Venture capitalist or they will reach a position to seek loans from commercial banks /financial institutions. Thus the proposed seed support disbursed by an incubator to an incubatee is positioned to act as a bridge between development and commercialization of innovative technologies/products/services in a relatively hassle free manner. Any other area as deemed necessary and recommended by the Management Committee. Incubatee has to be an Indian start-up. This support is not meant for Indian Subsidiaries of MNCs/foreign companies. Persons holding Overseas Citizens of India (OCI), Persons of Indian Origin (PIO) would be considered as Indian citizens for the purpose of this scheme. The share holding by Indian promoters in the incubate start up should be at least 51%. Is amount of funding requested enough to reach critical milestone? How big/fast growing is the potential market? Are target customers clearly identified? What are the sources of sustainable competitive advantage (eg. novelty, patentability, etc.)? What is the quality of the business plan (revenue model, product roadmap, market segments, etc.)? Selected start-up should be/become a resident incubatee of Venture Center and should have completed three months of residency at Venture Center at the time of seed fund investment. Application form can be downloaded here. Rohit is a well known name in infosec circles in India. He is the founder of one of India’s first infosec communities, ClubHack, IT Pro/SysAdmin community ClubSysAdmin. He is specialist in IT infrastructure, cyber warfare and cyber-crime investigation. He has been an advisor to several military agencies, law enforcement agencies and corporates in India and abroad. With the acquisition of JUNCO technologies, Quick Heal acquires this domain expertise, and in-depth industry and technical knowledge, and has launched Seqrite Services, a cyber security consulting organization, and will also launch Quick Heal Academy, to impart cyber security education programmes globally. ‘Seqrite Services’ will offer a Managed Security Services, including Cyber Audit and Cyber Forensics, Security Consulting and Security Operations Centre (SoC) to Enterprises and Government organisations. ‘Seqrite Services’ will be an arm of ‘Seqrite’, the Enterprise Security brand by Quick Heal which was launched in 2015. ‘Quick Heal Academy’ is created with the intention on building a talent pool of qualified cyber security professionals, who are in short supply in the industry currently. The academy will work closely with universities, law enforcement agencies, and education institutions to engage with students and design programs. The academy will offer Online, Classroom and Corporate training courses in Cyber Laws, Cyber Crime Investigation and Cyber Security. ‘Seqrite Services’ will be led by Rohit Srivastwa. Vishal Kumar, a specialist in Cyber Law, having diverse exposure through his association with PwC and Asian School of Cyber Laws, will be steering the ‘Quick Heal Academy’ operations out of New Delhi. Vishal has also been a member of the working group on Cyber Laws, Legal Framework, and the Cyber Security, 12 Five Year Plan (2012 -17) Government of India. Quick Heal, is of course Pune’s first major software product company to get an IPO, and is a provider of security software products and solutions in India. It has over 1,300 employees across 36 cities in India, and a network of over 20,000 channel partners. It has subsidiaries that are present in Japan, Dubai, the United States of America, and Kenya. Electric cars and buses are the future of transportation. Multiple goals: 1. Reducing fossil fuel dependence, 2. Carbon taxes and 3. Urban pollution/emission targets will drive rapid adoption of emission-less electric cars in the coming two decades. According to McKinsey’s forecasts, future cities could have up to 50% electric vehicles by 2030. We recently got an opportunity to visit the KPIT facility in Pune to see their electric bus R&D and manufacturing set up. We also saw the electric bus in operation, and got a nice ride in it around Hinjawadi in Pune. This bus was inaugurated at the Indian Parliament in December 2015 by the Hon. Prime Minister Narendra Modi. KPIT has been working in the area of hybrid (electro-mechanical) powertrains for many years now. Their ‘Revolo’ solution for converting existing IC (Internal Combustion) engine powered cars and buses into hybrid vehicles, has been field tested for over 150,000 km. 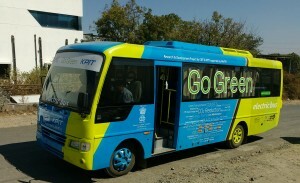 KPIT’s Electric Bus – The Prototype. Click on the picture to see full size image. The KPIT Electric Bus leverages and builds on this R&D and manufacturing experience. KPIT has filed over 20 patents in this area. Do note, in some aspects, an electric vehicle is simpler than an Electric-IC engine hybrid. Even if you leave aside the IC engine, a hybrid vehicle has to deal with power distribution, switching across the two power trains. In electric vehicles, there is no switching, as there is a single power train powered by electric motors. ‘Regenerative braking’ is used in both: hybrid as well as pure electric vehicles. The KPIT bus leverages Li-Ion batteries and multiple AC induction motors. The controller can bring in one or more motors online, depending on the power/torque requirements. The bus has a range of 100-200 km (depending on the Li-ion battery packs configuration). The motors can generate power between 80-240 KW with a Torque in the range of 450-600 Nm (depending on the selected configuration). The KPIT electric bus technology has been specifically adapted to Indian conditions. The KPIT electric bus also integrates with the KPIT intelligent transportation system and provides real-time monitoring of bus including location, vehicle health and driver behavior, along with traffic data and performance. On-board diagnostics and related remote monitoring is also available. KPIT is working with CIRT and other concerned authorities to further refine this technology as well as the necessary certifications. Going forward, there are two primary business models for KPIT: Working with OEMs and Retro-fitting existing vehicles. They are also in discussions with various OEMs regarding ’embedding’ their technology. KPIT estimates that their electric bus costs will be significantly lower than other solutions, given the indigenous technology developed and the ‘Make in India’ push. The currently available electric buses range from INR 2.7 – 4+ crores, and KPIT’s solution will be a fraction of that. Do note, the pay-back period should not just focus on the monetary savings, but the reduction in pollution and CO2 emissions. This will be a key driver for the adoption of electric vehicles in our congested, polluted cities. It’s good to see this kind of innovation and R&D happening in Pune, especially in the area of manufacturing and transportation (not just pure IT). The Economic Times is reporting that Pune-based EZMove has raised Rs 1 crore in angel funding from HNIs. Online home relocation service aggregator EZMove raised angel investment of Rs 1 crore from seven high networth individuals, including industrialist Hemant Bharatram, and Chicago-based Purvi Capital cofounder Ravi Srivastava, who have all invested in their personal capacity. Founded in August last year, EZMove is an online marketplace where a user can meet a reliable packer by simply filling out an online form. The customer also receives ratings of each of these vendors based on old customer experience and also feedback based on the startup’s screening process. At a minimum, the customer gets quotations from 3-4 packers. How are they planning on using the money? “We will aggressively expand to smaller towns and cities, and invest on our mobile website,” said Anand Agarwal, 36, who cofounded the company with Vishwajeet Singh, who he met while working at Geometric Software. EZMove expects a revenue of Rs 12 crore by December 2014 at current run rate. The movers and packers market in India is estimated to be about Rs 10,000 crore with mostly unorganized players. The founders Anand and Vishwajeet will be familiar to Pune techies from their earlier venture, cloud-based software development environment provider BootstrapToday. The insidiously deceptive factor common to the above statements is that they are all true – in part. Does the above list encompass everything Marketing is supposed to do? Actually, NO. Operations and Engineering are quite correct in their assumptions that Marketing is the proper organization for handling the above mentioned problem areas. But there is much more to the proper practice of Marketing for High Tech than what was mentioned above. It is a very broad field requiring depth and experience in both hard and soft disciplines, purely engineering and purely business fields, and both technical and customer interaction skillsets. And since these factors influence and interleave with each other, professionally complete High Tech marketers need to be able to swim these clashing currents without being pulled under or swept off to the side. Marketing is, fundamentally, a LEADERSHIP role. The very act of initiating a Marketing plan to execute the strategy for a company and its products means identifying the Value propositions which will make a firm’s offerings compelling to its target market. This means a high Tech marketer must be able to simultaneously grasp the potential of the company’s engineering team, the aptitude of its operations arm, the expectations, desires and dreams of its customers, and the capacity of its sales force. When a Marketing plan is formulated correctly, an enterprise will have the knowledge to develop the kinds of products its customers will happily buy, which the factory can skillfully build, and the sales force can readily sell. Marketers in High Tech can be overwhelmed by the 180 degree contradictions between the needs and desires of the Field and the Factory, especially at the junior level. Unfortunately, many choose the simplicity and expediency of picking a side. A technically oriented marketer will feel more drawn to their comfort zone thru siding with the Factory, whereas a more socially oriented or less technically savvy marketer will tend to gravitate towards the Field. Either choice is extraordinarily destructive to the business as a whole. Borrowing liberally from basic Physics principles, one could make the analogy that Conservation of Energy – every action causes an equal and opposite reaction – takes hold in such companies in a very negative aspect, with long term crippling effects. By choosing a side, a Marketer reinforces and exacerbates any existing antagonism between the two warring camps. A Marketer that fulfills his role properly is supposed to straddle the fence between Order and Chaos, reconciling them without forcing a damaging compromise on either. It’s no easy task, but skirting the challenge in favor of the easier path of taking sides creates a schism right down the center of the enterprise. It embeds conflict, distrust and friction between the Factory and Field, which ultimately translates into a complete disconnect between a company and its customers. It boils down to a loss of vital information. The Factory cannot design and build good products and solutions in a vacuum, but can hardly expect to gain insight into customer concerns, difficulties and aspirations if the company salesmen are unable to deliver valued solutions and support from the Factory to those customers, building the foundation for a long term relationship of communication, trust and mutual support. If the Factory and the Field are divided, the enterprise is choosing a path of creating successful products by a combination of learning thru serial failures and hoping to come up with a lucky choice of feature sets along the way. In the end, this is like jumping out a plane without a parachute, hoping to find someone who is more thoughtfully equipped on the way down. You can look inside the book here before buying a copy. Abhijit Athavale was born in Pune, India. He moved to the US for further education and lived and worked in the Silicon Valley before returning to Pune. He still lives in the same house on the same street. He has diverse interests – from hi-tech marketing to sports to WWII era history and mysteries and likes to read and write about them. Abhijit studied Electricial Engineering in COEP, followed by a Masters in Texas A&M University, after which he spent 11+ years, ending as Senior Marketing Manager at Xilinx, developing the marketing strategy for their $150MM+ Xilinx Connectivity solution – including messaging, value proposition development and product positioning. More recently, Abhijit has helping evangelize and market new technologies Markonix, a company he founded with the idea of helping lower the cost of marketing and learning for businesses worldwide. Abhijit also founded and runs PuneChips, one of the technology community platform incubated by PuneTech. PuneChips is a network for Semiconductor, EDA and Embedded Systems professionals in the Pune (India) area. PuneChips provides networking and learning opportunities from Industry mavens to its members. Techcrunch reports that Druva, the Pune-based backup software startup, has just received $25MM In Series D Funding from Sequoia, along with Nexus Venture Partners and Tenaya capital, bringing their total funding to $92MM. First of all, they have concentrated strictly on the enterprise market, foregoing the SMB and consumer markets that bring with them the lure of big user numbers, but lower revenue. Secondly, rather than being strictly a backup tool or sync and share, they have chosen a different route, what he says is more intelligent than simply offering “a data graveyard.” Instead, they look at data protection and governance on mobile devices, working with eDiscovery vendors like Recommind and AccessData to help companies entangled in litigation isolate and remove content involved in the lawsuit from the affected mobile devices with minimum possible disruption to the owner. And thirdly they can provide mobile device recovery if a device is lost to get a user back up and running quickly, and they can help IT assess what if any essential data might have been compromised..
puts them more in competition with traditional backup/governance/eDiscovery vendors like EMC, Symantec and HP than cloud storage vendors like Dropbox and Box. In fact, he says his sales typically involve both legal and IT, so it’s a bit of a different play than pure cloud storage would suggest. The approach has gotten the attention of customers like NASA, Pfizer, Dell and Hitachi among others, and they have gained 900 customers since their last funding round, growing from 2100 to 3000 enterprise customers in the last 10 months. Or check out all articles on PuneTech tagged ‘backup’ – you’ll get a history of Druva over the years. The third Pune batch of the Startup Leadership Program (SLP) will run from September 2014 to March 2015, and they’re looking for startup founders who’re interested in joining. The last date to apply is 1st August. SLP is a weekend course for startup founders that runs over 6 months (total of 60-hours). It is a volunteer driven program and the “training” is provided by successful entrepreneurs. SLP does not take any equity from the founder for this course – but they do charge some fees (Rs. 12000 this year) to recover their costs for running the program. This is the third batch in Pune – the first batch ran in 2012 and the class had 21 founders. SLP Pune’s Program leaders are: Sujata Bogawat (Director – Advantage Business Consulting), Abhishek Ballabh (Co-founder, ExtraAEdge.com), Koustubh Naik (Founder, Periwinkle Technologies), Tushar Komawar (Founder, Bharat Endeavours), Vinay Nathan (CEO and Co-founder, Altizon Systems). SLP bills itself as a selective, world-class training program for entrepreneurs who want to become top startup CEOs. Pune SLP Fellows will build a life-long network with a group of outstanding founders, and connect with a growing community of business partners, experts, advisors and investors. The program kicks off in September 2014, with 10 Saturday all day classes. SLP was founded in Boston, USA and now runs in 21 cities in 10 different countries. In all, SLP fellows have founded 700 companies that have raised $370 million from the world’s and include startups like Ixigo, DeliveryChef, NatureBox, SideTour, Micello, Momelan, Novira, Runkeeper, Sharypic, Schooladmissions, Shareaholic, Solar Junction, Voicetap and Ubersense. 10 startups founded by our Fellows have been acquired including Savored (Groupon), TomNod (Digital Globe), Kaptur (Aha Life), Momelan (Kinetic Concepts) and Fondu (airbnb). Here is the pitch for why you should consider joining SLP from PuneTech’s article about SLP when it was first launched in Pune in 2012. Startup Leadership Program is a NOT FOR PROFIT entity, registered in US and INDIA. What will entrepreneurs get out of SLP? Avoid entrepreneurial mistakes – as you learn from your peer group (that comprises of entrepreneurs from different background) and mentors (serial entrepreneurs, VCs, bankers, etc) and experts. Get solutions to your growth challenges – as you get feedback from super peer group and mentors. Connect to VCs/Investors and raise funding. Make real-life pitches.Understand what VC looks for. Get an understanding of term-sheet, legal aspects and exiting ventures. Be part of high-profile and high impact SLP Global alumni that will help you to scale up. Last but not least, make friends with entrepreneurs, as all know – its lonely at the top. Apply here. For more information about Pune’s SLP, contact pune@startupleadership.com. Helpshift, the Pune-based company that builds customer service software solutions for mobile app developers has recently raised $10 million in funding from Intel Capital, Visionnaire Ventures, True Investors, and the VC most active in Pune, Nexus Venture Partners. This funding is in addition to the $3.2 million it had raised earlier. We decided to take this opportunity to give PuneTech readers an overview of what exactly Helpshift does. Helpshift provides mobile developers with tools, software and an online service that allows them to easily incorporate various in-app customer support and service features in their mobile apps. The key to understand Helpshift’s offering is to realize that the current “industry practices” of customer support were largely developed for desktop applications and still have remnants of the era when everybody wasn’t always connected to the internet. As a result, customer service is still stuck in the 80s. However, mobile is a very different world, and it is possible to do things with smartphones that were not possible earlier. Thus, it becomes possible to create a customer service experience far better than anything else that was possible before. And mobile is eating the world, so developers need to pay attention. Tracking: Helpshift allows the app to easily track user actions and events in the app, and can be used to automatically attach customer and app configuration metadata along with every support conversation with that customer. The app developer can customize what medadata is automatically attached. This removes the biggest pain of any customer service interaction – that of collecting information about the configuration and environment of the customer, and what s/he was doing at the time of the issue. Reviews and Feedback: Helpshift also allows easy integration of the ability to ask customers for feedback on the app, or reviews on the appstore/play/marketplace. This can either be triggered automatically by the app software, or manually by a customer support person after an interaction with the customer. Localization and Internationalization: If an app is targeted towards an international market, it is important that all of the above features (messaging, FAQs, review/feedback screens) need to be made available in local languages. Helpshift comes with support for 12 languages out of the box, and if the customer has already set their device to the appropriate language in the device settings, then the correct language will be chosen automatically by Helpshift. For all of this, the app developer does not actually need to write all the code; just a little bit of code is needed to incorporate Helpshift’s libraries and online API. However, to ensure that the whole experience is seamless and appears to be part of the app itself, Helpshift allows extensive theming and skinning of its SDK so it can be made to match the look and feel of the app. Helpshift has been founded by @Abinash Tripathi and Baishampayan Ghose. Abinash, who’s the co-founder and CEO, is a serial entrepreneur who was the head of Zimbra India in Pune earlier before he founded Infinitely Beta, which experimented with various startup ideas (including the now defunct paisa.com) before settling on Helpshift. You might be interested in a profile we did of Abinash on PuneTech back on 2009. He was based in Pune, but shifted to the Silicon Valley after Helpshift began taking off. Baishampayan (aka BG) is the co-founder and CTO of Helpshift. Before Helpshift, BG co-founded a sport-based social network company and before that he was responsible for designing and creating the air ticket fare and reservation system at one of India’s largest online travel operators. BG is an active member of the Free & Open Source Software community and has contributed to many projects including Clojure, Ubuntu, Python and Django. We’ve realized we have something that most mobile companies could benefit from and the only challenge for us has been the ability to scale to meet the explosive demand. This round of funding will enable us to attack each of these major mobile verticals and bring the benefits of Helpshift to thousands of app publishers. most of the company’s growth so far has been organic. With the help of this new funding, the company plans to expand its sales and marketing team in San Francisco. He also notes that the company will continue to invest heavily on building the end-to-end customer life cycle tools for mobile companies to provide the best customer experience and solve the customer retention issues they face. The company says its service has now been installed on over 150 million devices through the different developers that have integrated it into their apps. Helpshift counts Supercell, Glu Mobile and Flipboard among its customers, but as part of its plans to expand its service, the company will specifically target mobile commerce apps and on-demand services like taxi and food delivery. LetsVenture CEO Manish Singhal and Indian Angel Network’s Sharad Sharma acted as lead investors for the deal. The company was founded in 2012 by former Patni Computers employee, Kunal Lagwankar. AdSparx uses a server side technology to serve device independent, high quality, targeted, pre & mid-roll video ads for linear TV, live events and videos on demand. It counts NexGTV, Vodafone, Airtel and Sony Liv among its notable clients. The startup has done mid-roll ads for online streaming of Indian Premier League, French Open and New Zealand Cricket Series in the past. Lilesh Ghadi – CTO. MTech from IIT-Bombay. Kunal Lagwankar – CEO & Co-founder. BE from VJTI. Ketan Barhate – Head of Engineering. BE from VJTI, Research Assistant at IIT Bombay. In case you find such things interesting, here is a US patent application (not yet granted) that AdSparx has filed. Pune based Swipe Telecom, which has been selling low-priced tablets in the Indian market for the last 2 years has received Rs. 30 crore in funding from Kalaari Capital, [reports the Economic Times][blink]. Swipe offers around 23 types of tablets which include those with 3D resolution as well as a range aimed at children. While its current products are on Google’s Android platform, it will soon introduce tablets on the Microsoft Windows platform. “We want to be a leader in one category ,” said Shripal Gandhi, cofounder & CEO of Swipe who has 11 patents in nanotechnology. He has earlier worked at Unidym, where he worked on touch screen technologies for clients like Samsung and Apple. It is this focus that is proving attractive to investors. The fast growing company, founded by Gandhi and Aman Gupta two years ago, has seen a three-fold increase in revenue which touched Rs 100 crore in fiscal 2014, with an estimate to touch Rs 300 crore next year. Swipe Telecom, which says it can develop and roll out products in five weeks, is able to customise its tablets for enterprises and plans to make pre-loaded tablets for education institutes and banks.